Who doesn’t love the IHOP Cinn-a-Stack Pancakes? These pancakes combine both the pancakes and cinnamon rolls. These pancakes have a creamy sweet cinnamon layer between the pancakes. Instead of syrup, these are topped with a light cream cheese frosting. There is one meal that I love to go out for, that is pancakes. These pancakes are no exception. These are a wonderful treat you can enjoy on the weekend. I would go to say that these may be even better than those you get in the restaurant. Why are they better? You can use real butter when making the cinnamon layer, and this tastes so much better than the ones you get in the restaurant. 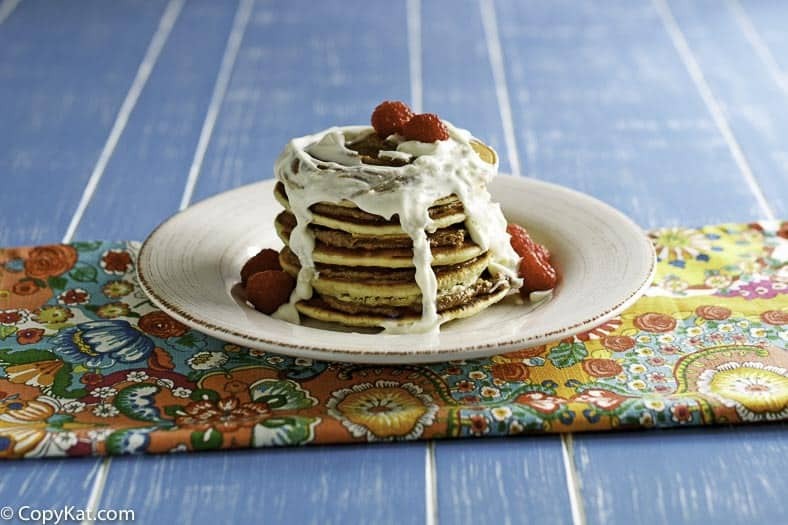 If you love both pancakes and cinnamon rolls you will love these pancakes. They are simply scrumptious. The IHOP pancakes are a classic, and when you combine the goodness of a cinnamon and sugar spread on them with a cream cheese frosting it is very difficult to get more decadent and this. These pancakes are made with simple everyday ingredients that you can find in your pantry. Flour, sugar, eggs, buttermilk are the backbone of this recipe. The cinnamon layer has brown sugar, cinnamon, and butter. This gets topped with a very basic cream cheese frosting. Do you love the IHOP? Be sure to check out all of these great IHOP recipes. You can make your own IHOP Cinn-a-Stack Pancakes at home. To Make the Cinnamon Layer In a small bowl combine the butter, brown sugar, cake flour, cinnamon, salt, and vanilla. Stir until well blended; set aside. Please note this should make a nice thick paste. To make the cream cheese icing Use a mixer to blend together the cream cheese and the butter until light and fluffy. Slowly add the powdered sugar. When the powder sugar has been incorporated blend in the milk and the vanilla. 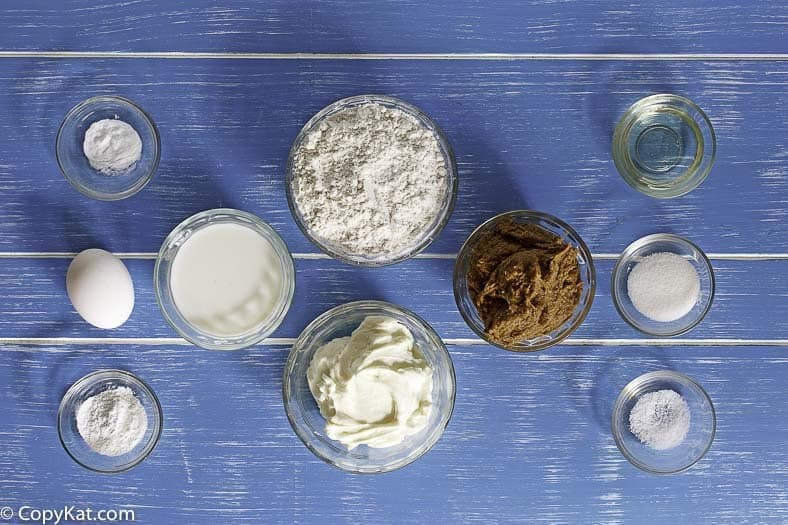 To make the pancakes: Place the dry pancake ingredients (flour, sugar, salt, and baking soda) into a bowl, and stir to blend the dry ingredients. Add buttermilk, oil, and egg. Use a spoon to mix the pancake batter and beat until just smooth. Heat a skillet or an electric griddle to 350 and spray with non-stick spray. Pour about 1/2 cup of batter to form a 4-inch pancake. When the pancakes start to show small bubbles on top, turn them over to finish cooking. You can assemble the stacks just before servings. Spread 2 teaspoons of the cinnamon mixture over one pancake, layer another pancake on top, spread 2 more teaspoons of cinnamon mixture over the top, and then drizzle with the cream cheese icing. The leftover cinnamon mixture goes great on toast too! I am sorry you didn’t like this recipe. 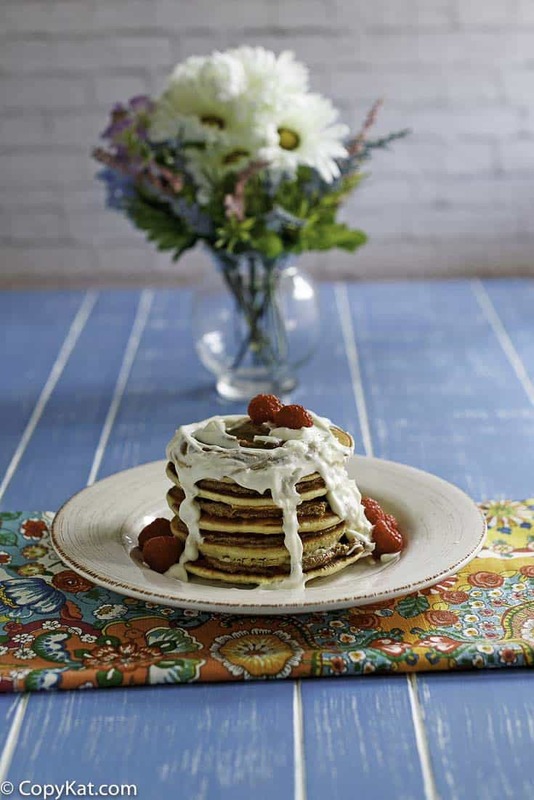 Scrumptious is best fitting word here to describe these heavenly pancakes! I tried the cream cheese icing and it taste exactly like IHOP! Keep up the good work I WILL BE trying more!! Hi, Thanks for the recipe. My kids loved it! In answer the the grit issue of the brown sugar, Use a sifter AFTER you have measured the packed brown sugar. After sifting the granules will be smaller. This might help make it less gritty. Hi Stephanie just a quick question: In the video you mentioned adding two tablespoons of cake flour but the printed recipe indicates two teaspoons. Can you please confirm which is the correct amount? Looking forward to trying this recipe out for my husband. Thanks. Family loved them…gave me an 8 out of 10 rating (lol). How can the cinnamon paste be tweaked to make it less gritty? Perhaps you could try to melt it, it may take care of the brown sugar being a bit crunchy. The grit of the cinnamon, I am not sure. I am guessing the base they use contains corn syrup, and that is something I would prefer to stay away from. I was very pleased with this recipe. I will tweet it in the future to make it less sweet. I used regular buttermilk pancake mix. I had a similar experience eating them as when I ate them in the restaurant. Thanks for sharing, Stephanie! You made my day along with my husband’s! Kudos to you for this site. I used your recipe for breakfast this morning. Only change I made was adding 1T of half & half to the Cinnamon spread and per my Husband’s request I made French toast instead of Pancakes. It turned out amazing, thanks for sharing :). Made these this morning by watching your video and using your instructions,come out great,although I was wondering can you choose not to use salt in the cinnamon paste?and Thank you for this recipe. You could leave out that salt, I think the salt does make it taste better. The cinnamon sauce and the frosting are well made, but the pancakes are a little sour. If you had used an old fashion pancake recipe, it would’ve tastes 10 times better if the pancakes were different. A little disappointed to be honest. Thanks for letting me know. This was the traditional buttermilk pancake like they make.